The new Bridge Theatre near Tower Bridge in London has launched to great acclaim much arising from Nicholas Hytner's reputation built so successfully at the National Theatre just a short distance away along the South Bank. For those who can't get tickets for the theatre, NT Live enables anyone in the country the chance to see these productions from the comfort of their local cinema. 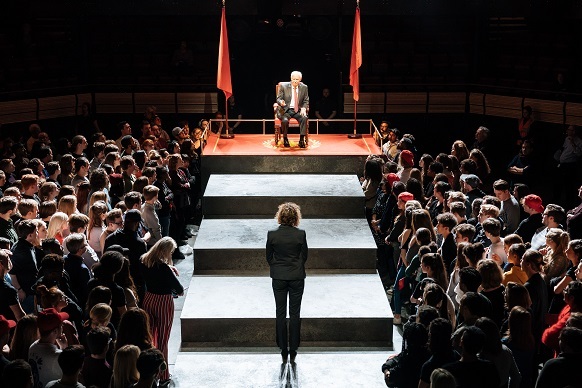 The latest offering, broadcast on Thursday 22nd March, was Hytner's production of Julius Caesar which has run at the Bridge since 20th January. The challenge with the broadcast was how to translate an immersive promenade performance to the big screen. Julius Caesar was written by Shakespeare in 1599, set in 44BC and structured over five acts in streets of Rome and plains of Philippi with a mainly male characters. Hytner has worked with the amazing designer Bunny Christie to update the location to a modern republic with pistols and barbed wire and changed the gender of key role of Caius Cassius to rebalance gender mix of play. The central characters Caesar, Mark Antony and Marcus Brutus are well known historical figures and the basic plot is very familiar but the updating works and gives the production a fresh modern feel. This version runs for two hours fifteen minutes without an interval. 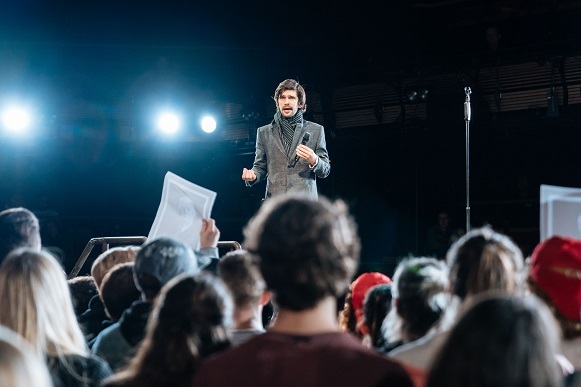 The production uses the Bridge stalls area to create an ever changing space with rising platforms and carefully stage managed audience to create a highly charged mob surrounding and greeting the protagonists. The show opens with a four piece street rock band playing such tunes as "the eye of the tiger " to rouse the audience into active participants. Part of the excitement of this show comes from that experience but this does not translate so well to the cinema screen and close ups of audience members faces distracts from the main performances. However this is compensated by the full screen shots of the central characters, often filmed against the blackness of the venue walls and ceiling which gives a real appreciation of their intense powerful performances . Ben Whishaw is extraordinary as the idealist loyal republican Marcus Brutus who sees the act of killing Caesar as a justifiable defence of the concept of a republic against the tyranny of Caesar's rule. 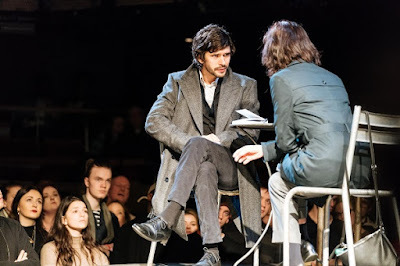 He is matched by Michelle Fairley as Caius Cassius who manipulates Brutus into the public killing. They are opposed by David Morrissey as Mark Antony, loyal to Caesar but equally manipulative of the crowd in his pivotal speech at the Emperor's funeral. The smaller part of Julius Caesar himself is played with arrogant authority by David Calder. All four speak the Shakespeare verse with great clarity and precision. A slight downside of the broadcast is close ups of the dead Caesar and Brutus clearly show them all too obviously breathing! the big screen you can sense the excitement felt as part of the promenading audience but whereas on many cinema broadcasts the process has enhanced the viewing experience, for once this broadcast detracts from the live show. This should not deter anyone from seeing an encore broadcast and we hope that the West End continues to embrace this new medium to widen their audience reach and bring their productions to a geographically spread population.